The Southern Berkshire Regional School Committee electing new officers by secret ballot, which is a clear violation of the state open meetings law. Editor’s note: This article has been revised to correct a misimpression about Superintendent Beth Regulbuto’s evaluation and to include links to her goals for 2018-19 and her first-year evaluation. Sheffield — After a challenging autumn, the first and smallest K-12 regional school district in the state has had yet another rough week. 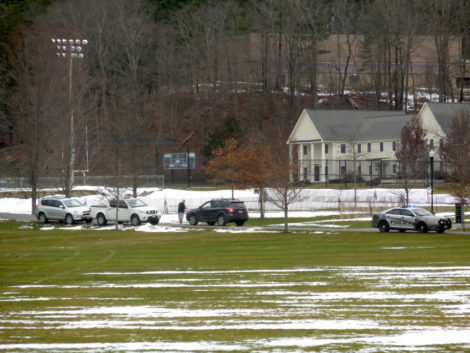 A bomb threat on Friday prompted the evacuation of the Southern Berkshire Regional School District campus in Sheffield. No one was hurt, students were evacuated to the private Berkshire School, and no bomb was found. Parents, however, were rattled by late-morning emails and text messages they received from Superintendent Beth Regulbuto. The district has been in a stand-off with one of its member towns, Egremont, over the resumption of classes at the tiny South Egremont School, whose operations, after a recent renovation, were suspended by the district because of the discovery abnormally high levels of lead. In retaliation, an angry Egremont Selectboard passed a resolution in October to withhold hundreds of thousands of dollars in payments to the five-town regional school district until the matter was resolved. The Selectboard was already miffed at the School Committee’s decision in 2016 to put the Egremont school on hiatus — an action which prompted a lawsuit from the town of Egremont that was later settled. When a settlement over the withholding of payments was discussed at Thursday’s public meeting of the regional school committee, longtime member and finance subcommittee chair Dennis Sears walked out of the meeting, complaining that it would be “extremely foolish” to sign the document and insisting he was going to resign over the matter. Earlier in the meeting, there had been other surprises: Chairperson Bonnie Silvers of Sheffield, had been ousted from her leadership position on the committee, and Sears was denied a bid for vice-chair. Adding to the committee’s woes was that the vote was taken in open session, but by use of a secret ballot — a clear violation of the state’s Open Meeting Laws, the Edge has learned. Also during Thursday’s meeting, Regulbuto’s goals for 2019, developed with the Executive Evaluation Subcommittee, were discussed. Click here to view the goals and click here to view her first-year evaluation in which she was rated “proficient” overall. 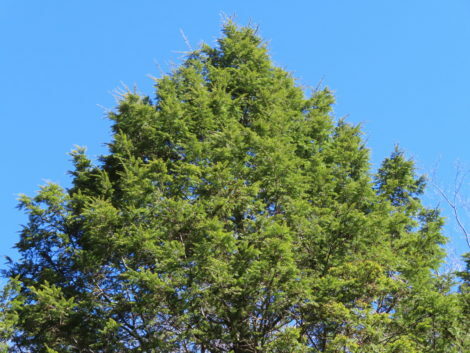 Click here to view the on-demand video recording of Thursday’s meeting by Community Television of the Southern Berkshires. 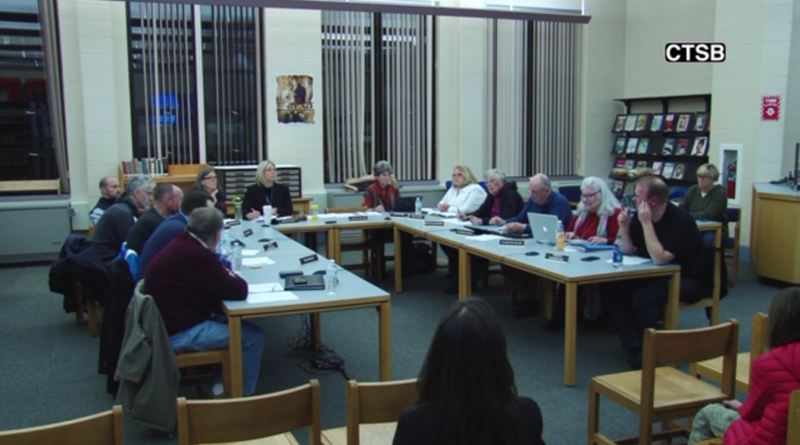 Fast forward to approximately 2:25:00 to see the brief discussion on the evaluation that was unanimously accepted by the school committee. Sears, who was first elected to the school committee in 2008 and was just re-elected last month, left a voicemail for The Edge on Friday but declined to comment further. 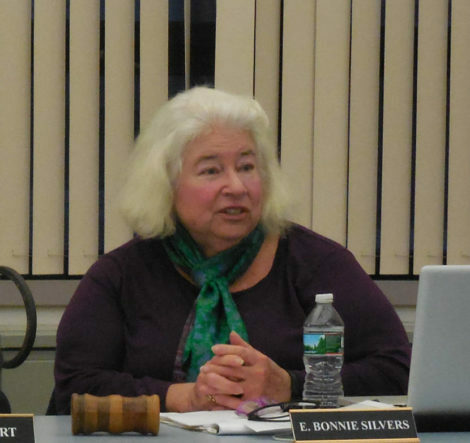 SBRSD School Committee member Bonnie Silvers. “It did get a little heated at our meeting last night over some issues that might have been discussed, but basically you don’t resign until you actually send a letter and I have not sent such a letter,” Sears said. The agreement that rankled Sears was passed in executive session earlier that night. It said that the South Egremont School would open on or about Jan. 2, contingent up the completion of appropriate actions to remediate the lead inside the building, using lead remediation painting, along with the setting up of an appropriate perimeter, Silvers said. To address the concerns of Sears, the settlement will be modified by the district’s attorney to the effect that the district will be held harmless should there be any issues related to the wellbeing of the children who will be attending the program starting next month in South Egremont. In other words, the district and its School Committee members could not be held liable if children and staff were harmed by the condition of the school, even after the remediation efforts. But Sears wanted to see the precise language that would be inserted and then have the agreement come back to the School Committee for another vote. The settlement and stipulation had already been approved in executive session earlier in the evening, with Sears the lone dissenting vote. Newly installed chairman Art Batacchi would not entertain a motion to revisit the vote. “It is important to move forward in good faith,” agreed school committee member Kenneth Knox of Egremont. “I’m sorry mister chairman; I resign; I’ll be leaving,” Sears said, raising his voice. “That’s it, we would be … I’m not going to be that foolish.” There was an awkward silence as Sears’ colleagues watch him retrieve his hat and coat from the other side of the room and leave the building. In a subsequent interview, Silvers, who is viewed by most as ally of Sears, said “a number of people” have since spoken with Sears and that his concern centers on the “need for protection” of School Committee members individually. The emotional episode happened after Sears and Silvers, both of Sheffield, had been denied leadership positions on the committee. Since Thursday’s meeting was the first for the committee since the November elections, Regulbuto acted as chair until officers could be elected. Sears nominated Silvers as chair. Silvers, an experienced retired educator, had chaired the committee for the past year. 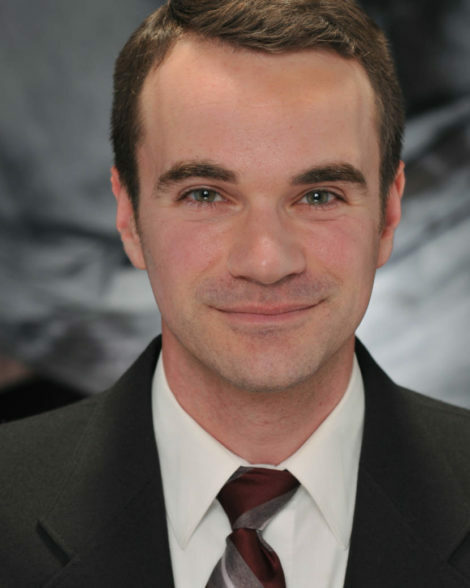 Newcomer Tim Schroepfer nominated Art Batacchi Jr., who had served previously on the school committee for four years in the late 1990s and is a current member of the Sheffield Conservation Commission. Batacchi is also a graduate of Mount Everett Regional School and sent his children to the district as well. SBRSD School Committee member Kenneth Knox. School Committee member Maryellen Brown of Monterey proposed that the members vote in a secret ballot. Only Knox objected, “in the name of transparency,” he said. So the secret vote proceeded and makeshift ballots were passed around. Batacchi emerged the victor and Schroepfer won the position of vice chair over Sears, whom Silvers had nominated. In a text message on Sunday, Silvers acknowledged that the vote was illegal. She said a revote would occur on Thursday. Students and faculty walked down the campus driveway to Berkshire School Road, where buses took them to the gymnasium at Berkshire School, a private boarding and day school on Undermountain Road (Route 41). All other traffic was diverted away from Berkshire School Road until the evacuation was completed. A Sheffield police cruiser and other vehicles stand watch at the driveway entrance of Berkshire School on Friday morning. 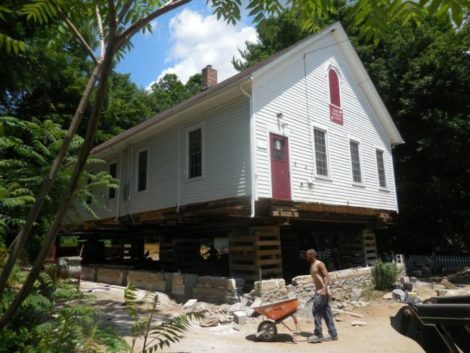 After the students were safely at Berkshire School, Southern Berkshire officials decided to dismiss the students for the day. 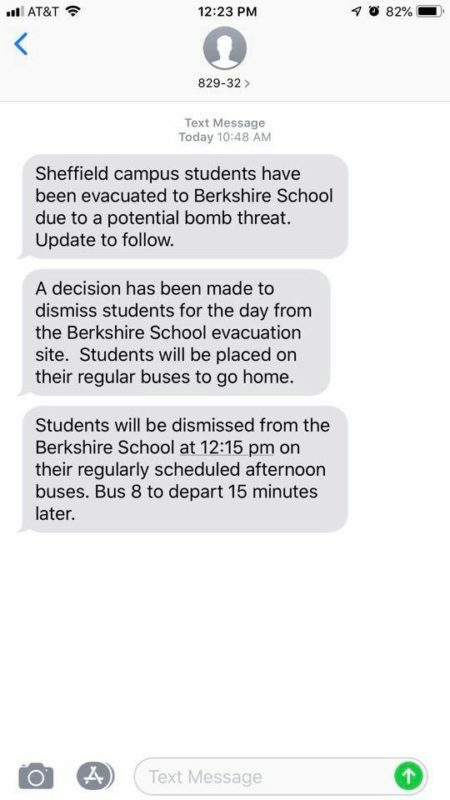 Buses arrived at Berkshire School at approximately 12:15 to take the students home and parents who normally drive their children were alerted. In addition, the school building was open Friday evening and Saturday morning for students to retrieve their belongings for the weekend. Ironically, it might have been one of the few public events in the district that went precisely as it should have that week. 1. 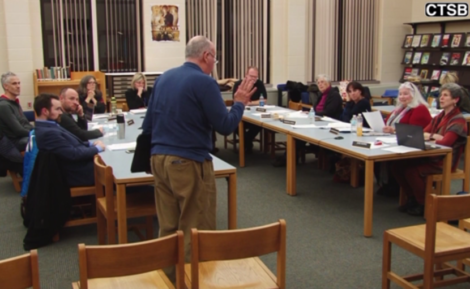 Dennis Sears was not “ousted” for any leadership position at last Thursday’s (November 29) school committee meeting. There was no leadership position that he held that he lost. 2. The Southern Berkshire Regional School District (“SBRSD”) is not the smallest regional school district in Massachusetts as claimed by Mr. Cowgill. The Farmington River Regional School District, only several miles east of the SBRSD, has about 1/5 the number of students. 3. The reporting on the resolution of the lawsuit filed by the Town of Egremont against the school district is inaccurate. The terms of the settlement did not require the program at the Egremont School to be re-opened in 2018, after the hiatus in 2017. There were two options and even a cursory reading of the settlement document will show this to be the case. And something else: There was either a bomb threat at the school last Friday or there was not. A “potential” bomb threat is sort of similar to a potential automobile accident. Every car on the highway represents a potential accident. If we paid attention to potentialities, we wouldn’t have any time to do our regular day jobs. Thank you Carl for being so helpful. 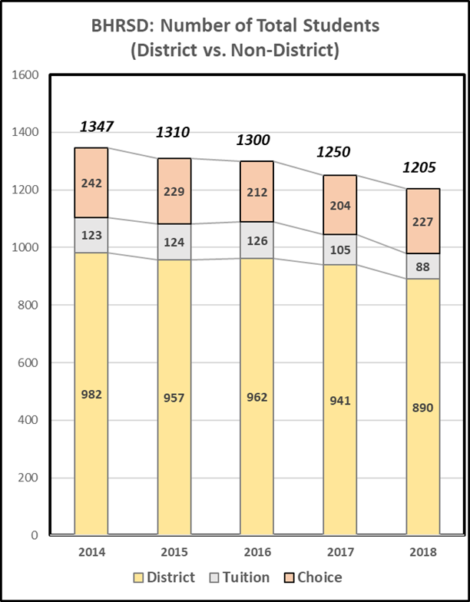 SBRSD is smallest K-12 regional district. As you probably know, Farmington River does not include grades 9-12. That has been clarified. It was my understanding that Sears was vice chair behind Silvers. The district website does not say who the officers are. If indeed, Sears was not in a leadership position on the committee during the previous year, then I will be happy to correct that. Since the school committee subsequently made no such effort to follow the guidelines for closing the school, then was it not obligated to fund the program and therefore reopen the school? I have also clarified that above. Click here to read our original story on the first settlement and click here to see the signed settlement itself. Thanks for being a loyal reader of the Edge. 1. You would have avoided the need to be corrected on regional school district size if you’d included the “K-12” designation in your original story. 2. Dennis Sears was never Vice-Chair and you attended a number of school committee meetings at which Fran Lartigue, of New Marlborough sat at the table with her nameplate indicating her position as vice-chairman. Up until the recent election, the district website contained that information. 3. I don’t wish to argue the nuances of the settlement agreement with you but suffice it to say that funding the South Egremont School would not necessarily mean “opening” it for an education program. For example, the school committee funds the school for the 2018-2019 academic year and no student registers to attend the school. In that event, would the district be required to “open” a school that had no students? It is unfortunate that the author seems to have completely misunderstood the shareout of the progress of SBRSD’s Executive Evaluation Subcommittee at last Thursday’s meeting. The article mischaracterizes my report, and I’d like to set the record straight. Rather than being critical of Superintendent Regulbuto’s performance, the subcommittee applauds her efforts and is encouraged by the progress that she has made. We have not released an evaluation. We have voted to approve her goals for the district. If readers take the time to watch the video, they will hear me talk about how much we value the Superintendent’s commitment to cultivating a culture of continuous improvement throughout the district. I spoke generally about how difficult it is both to give and receive feedback from our colleagues, but I am personally convinced that feedback and evaluations are essential tools for establishing a forward momentum and growing as professionals and serving the students we are educating. The Superintendent models this growth mindset for her administrative staff, for the faculty, and for the entire district. I believe this is one of her greatest strengths, and she is leading by example. Thank you David for that important clarification. After receiving the documents this morning, I revised the section in question and included links to both the goals and the first-year evaluation. 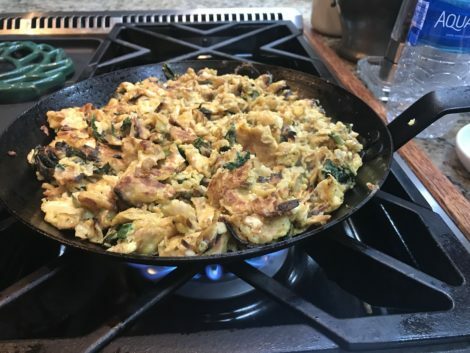 Thank you Terry – much appreciated! Democracy has many great qualities. The will of the people was expressed on November 6th. Carl Stewart was not returned to office. Jon Bruno received the third slot in Sheffield. In an effort to move into the future, the school committee voted to move ahead on the Egremont question, and to rotate the Chairmanship. Thank you for that. They are also attempting to seat Jon Bruno, who won the majority of votes to be seated. Democracy stays fresh and strong when the old gracefully step aside for the new. Send in your letter Mr. Sears. While I appreciate the Edge removing Carl Stewart’s snide remarks about my age and occupation, his post pointed out two important things. Carl continues to practice his Trumpian belittlements by referring to me as a part time crossing guard, and that it is his intention to now personally close an elementary school that can only be closed through a protocol laid out in the SBRSD school agreement over which he now has no control at all. Having failed to do so legally, his clearly feigned concern for the welfare of the children, their families, and the SBRSD itself is now clearly seen in its true light.- a politically motivated ideology that expresses no real care at all for our communities. Let’s remember that. Ms. Bachelder is wrong about the protocol for closing a school building in the Southern Berkshire Regional School District. If 4 of the 5 towns vote to close one of the District schools (or to open a school), no action by the School Committee is required other than the ministerial act of affirming the decision by the citizens of the towns. I have just as much power or lack thereof as does Ms Bachelder in this regard. Actually, probably quite a bit more as there are quite a few people who recognize my 30 years as a member of various governmental bodies in the Berkshires. And the removal of my comments by The Edge is the height of cynicism by their editor. Nothing I said about Ms. Bachelder regarding either her age or her vaulting of herself as a crossing guard at the Egremont School was untrue. The Edge continues without abatement to publish ad hominem comments but they were looking for a way in which to punish me for supposed disloyalty. If it can be done, why do it?